PAINFUL, ACHEY, STIFF BACK? 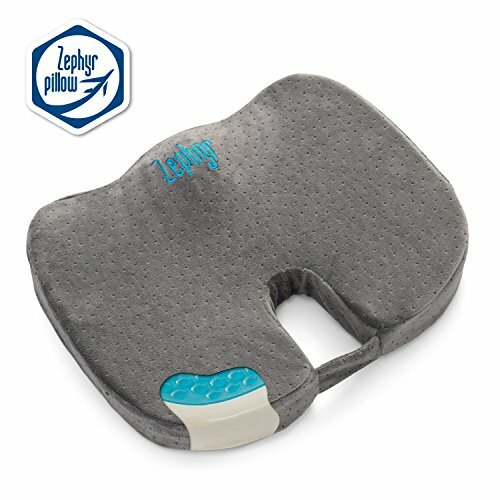 GET orthopedic memory foam seat cushion w/ CONVENIENT features like a GRIPPY NON-SLIP bottom, an EASY-CARE machine-washable zipper pillowcase, a TAKE-ANYWHERE HANDLE, a STAY-COOL heat diffusing surface layer ALL BUILT AROUND the BEST ORTHOPEDIC MEMORY FOAM lumbar support on the market! 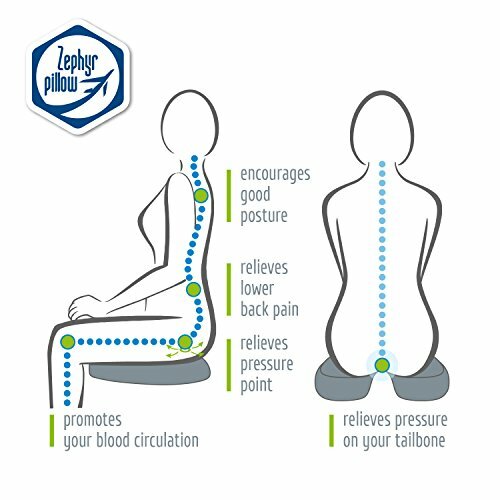 PERFECT TAILBONE CUSHION – From the moment you sit down our CLOUD Support Multi-Layer Technology starts working to alleviate your discomfort, quickly realigning your posture and relieving pressure off your tailbone and coccyx so you can stop focusing on the pain and get going again. 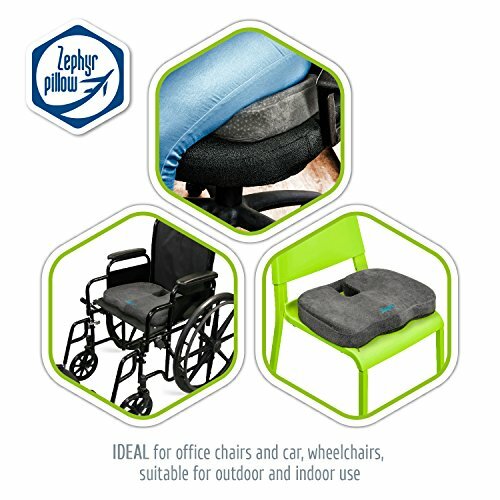 FASTER RECOVERY – SCIATICA support cushion provides unparalleled relief and cushioning during recovery from lower back injuries, tailbone injuries, herniated discs, unexplained sciatica pain and more – making it IDEAL office chair cushion. 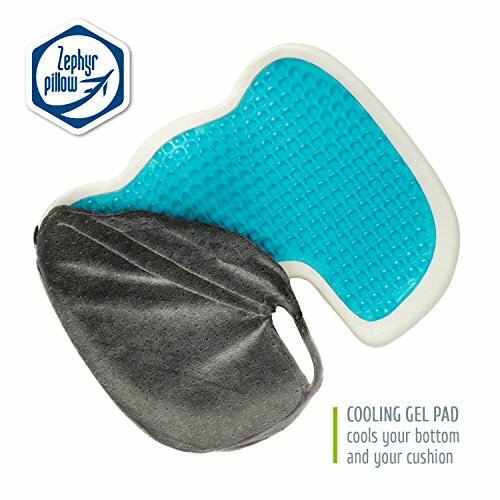 GRACEFUL TRANSITIONS – SIT TO STAND with ease: Gel memory foam cushion your back in alignment even as you ‘roll forward’ to stand up, ensuring maximum relief past the point of ‘the pinch’, allowing you to transform from sitting to standing with ease. 6 MONTH GUARANTEE – WON’T GO FLAT: Don’t let back pain stop you from accomplishing tasks, attending games and trotting around the globe. We GUARANTEE you’ll experience the most revolutionary support in orthopaedic seat cushions, or your money back, no questions asked. 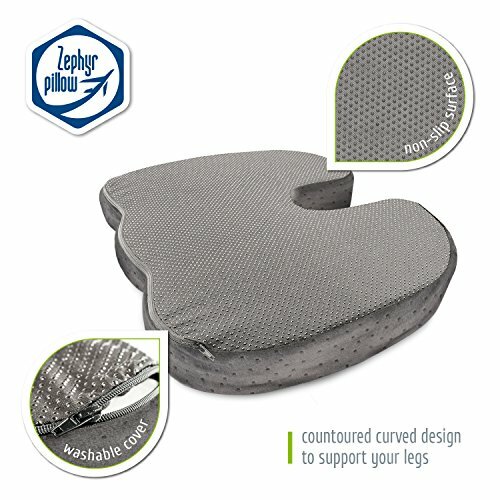 Ergo-Max offers multi-layer, ergonomic lumbar support, so it won’t collapse, crunch down or shrink. Sure, slouching might provide temporary relief from the pinching pain, but the long-term result is increased back pain. promoting orthopedically correct posture and pressure-free office chair back support! guarantee you’ll experience the most revolutionary lumbar support, or your money back, no questions asked.